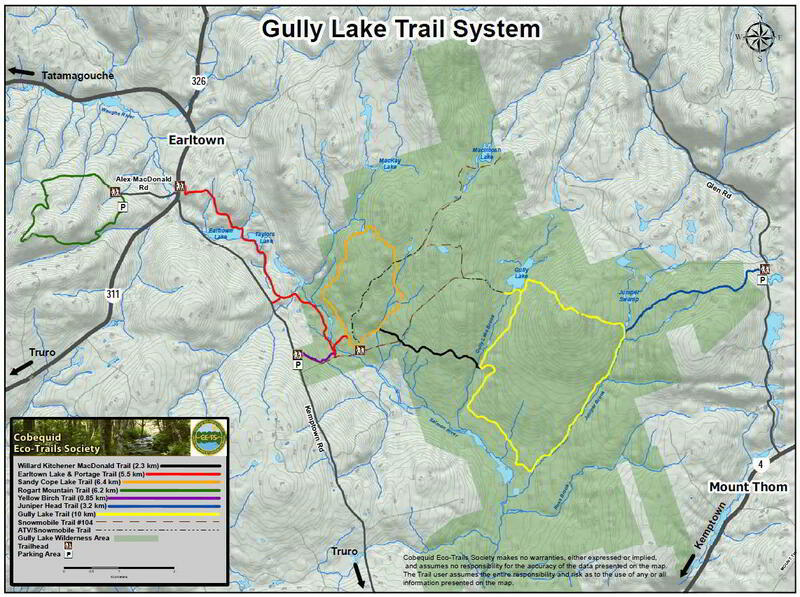 The Gully Lake Trail System is a 34 km wilderness hiking trail system, developed and managed by Cobequid Eco-Trails Society. The network of trails is located in the Cobequid Mountains near Earltown and Kemptown. The system currently consists of three independent loops ranging from 6 km to 10 km, in addition to linear connector trails. Highlights of the trail system include Gully Lake Wilderness Area, Caribou Lake Brook, Taylor Lake, Earltown Lake and Rogart Mountain. The trails also pass by or are near numerous waterfalls and ecologically sensitive marshes. Access to Gully Lake Trail, Willard Kitchener MacDonald Trail and Sandy Cope Lake Trail via Yellow Birch Trail can be found at 1734 Kemptown Road. Access to Juniper Head Trail , and another entrance to the Gully Lake Trail can be found at 737 Glen Road. Access to Earltown Lake and Portage Trail can be found at 5300 on Highway 311. Click images to enlarge (opens to new tab).